Mama Violet (left) and Josephine taking a break during our recent journey to Dipalata. Prior to opening my journal, I had no idea what I was going to blog about. Our fifteen short days here have been filled with emotion. I am not the same having seen the moon shine 10,000 miles away from the place I call home. The short time in Zambezi has shown me more about myself than any of the many self-assessments I have taken in my short twenty years. After busy days in our classrooms, many of us take a journey to Zambezi Motel where we take time to soak up the fiery-red sun as it dips below the horizon and gives way to a nearly full moon. This transition ends just another day we have spent understanding what it means forus to be here, as many of us struggle with finding our purpose in Zambezi. This transition is a helpful reminder to spend time taking in the beauty of our opportunity and break down expectations for ourselves. This transition reminds us that tomorrow we will begin again, another day of endless opportunity. Our days hold abundant class time and trips to the market. But perhaps the most prevalent aspect of my daily experience is the role played by our Zambian mamas. Zambezi holds the most colorful sunsets I have ever experienced but also strong women that remind me of the ones I leave at home. Although I have seen the moon shine on the other side of the world, the mama’s that surround us make Zambezi a home away from home. Around the convent our mamas, Katendi and Violet, keep us both safe and very, very full. Mama Katendi spends her time with Mama Violet in the convent’s kitchen preparing our meals. Each time I pass through the front doors, I am greeted by both of these mamas with smiling faces and hugs. Each of us gets the privilege of being “Mama’s helper,” one day while we are here. This gives us the opportunity to spend extra time with the mamas and learn about their personal lives, all while preparing food for those who reside in the convent. Last week, I was lucky enough to get to be Mama’s Helper. While carrying three chickens that Mama Katendi would soon kill for lunch, I learned about her life. She moved from Zambezi with her children in 2014, to leave behind a life that she no longer wanted to live. From that moment on, she has provided for her seven children on her own. Mama Katendi travels here from Mufulira (781 kilometers), just to spend the month here in Zambezi with us. Working alongside these women for the day showed me how much work these women put in to get food on the table for us. Mama Nancy comes to the convent three times a week to assist us in cleaning the home, and doing laundry for us. She raises her granddaughter, who was left at the loss of her daughter, who lost her life in child birth. Mama Josephine visits the convent three times a week for language lessons. She shares stories about her life and career as a Zambian politician. Involving herself in politics at the young age of thirteen years, she is well known among those in the Zambezi community. It is inspiring to watch her lead so passionately as a woman, as it is uncommon to be a female politician. These women have pushed the importance of women being self-advocates and being strong enough to live on one’s own. Mama Josephine emphasized this during a past language lesson, as she learned before becoming divorced from her husband. When I am called a “strong girl,” and “hard-working” from these women I feel a sense of pride, but also undeserving of these affirmations. These women have fought hard to keep their families safe and give those around them a good life. They drop their lives to take care of 19 Gonzaga students that they may only know for 21 days. These women tell us that they care about us, and they are always here for us. I am humbled knowing that these women share their love so easy, and expect nothing in return. They are passionate, strong, hard-working women that make you feel their presence. Their work is not publicized, but felt by those around them. These are the women that I aspire to be like in different ways. 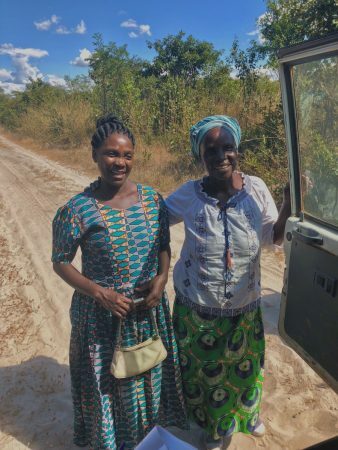 These women in Zambezi are like the woman who raised me, and I see a part of her in each one of them. I have been asked a couple times who has taught me the importance of hard work from, and it is safe to say, I got it from my mama. To Emmitt: Congratulations on finishing up your senior year of high school! I am very proud of all that you have accomplished and will continue to accomplish at UW. I wish I could be there to celebrate! To Zach: Good luck in the NWAC’s this week! Cheering for #15 from Zambezi!! To the rest of those I love: I cannot wait to share my experiences in Zambezi with you all! Thinking of you each step of the way. I am laying in my bed crying over your words. Everything you wrote about our wonderful Zambian mammas is bringing me right back to that little convent you get to call home. I am not usually too emotion of a person as you know, but something about being in Zambezi and now reading about Zambezi really gets my emotions going. I don’t think I laughed, cried or felt any other emotions in between more times than I did in that little village in Zambia and reading your words are bringing them back up. I hope you all are embracing all the emotions that come flooding in with this experience and feeling them just as much. When I saw today was your post I was so excited you don’t even know! The mammas have so much love to give. How many times has mamma Josephine made you sing “twaya monta” in a row yet? Haha. I can also still hear mamma violet saying dinner is as follows vividly. Mamma Katendi is one of the strongest women I know. Absorb every minute with each one of them. Kate and I just moved into our (beautiful) green carpeted house here in the Logan neighborhood today. Going to be a little lonely and quite without the other 5 of you here Can’t wait to hear about everything you have experienced. Also how was dipalata?!? Hopefully the land cruisers made it in one piece. Sending all my love, prayers and hugs to each and everyone of you zaggies! Heck yes, strong Mamas. Their tireless care and hard work keep us alive and fat and greeting that lovely red sun each new morning. I’m not surprised that you chose to write about the mamas, as your awe and appreciation for them have been clear since day one. You communicate with such ease, using humor and love that easily cross language and cultural barriers most people are too shy to attempt. Your boldness and grace (ha) inspire me. Maybe I’ll even be nice to someone on the bus this morning. Zags, I hope you’re enjoying your breakfast and working hard through this second week of classes. I so wish I could be there with you. After 15 hours on a bus yesterday, I reached Ndola. This morning I’m starting off for another full day of bussing, hopefully to reach home before dark. Thanks for having me and letting me love Zambezi with you. Sorry I didn’t get to say goodbye to some of you, but I guess we’ll just have to hang out again. PS – Jeff, thanks for the mango high chews and the chameleon. My seatmate was thoroughly horrified. Thank you for writing about the strong, wonderful, powerful, hard working, amazing women that you have there taking such good care you Zags. Please give them a thank you and love from us “other mommas” here. Much love to all of you. PS. Holly, I hope that you can capture a picture of one of those sunsets. God bless Mamas! If you are the Grace, Tom and I met at the airport on your way to Africa, I could tell in that brief moment that you are a kind strong woman. You’ve posted beautiful words. Thank you for sharing! Thanks for these last posts. Peg and I found ourselves really missing the updates when you took your weekend adventure. Your posts have really filled me up with your adventures, learning and the awe of immersing yourselves in a new culture, with new friends. Thanks. Hard to believe your trip is almost half over. p.s., Devon, Marvin is in good hands. I’m getting him into the ‘doctor’ this week. Love you. Thank you!! I’ve been looking at the moon the last few nights and thinking of all of you!! Hug those beautiful Mamma’s for me!! Tireless kindness, hard work, love…the most precious gifts. Hugs to all. Love you Bridget!! So good to hear that strong mamas are taking care of our Zags . These strong mamas are wonderful examples of Christ in action. It sounds like there is a lot to be learned from them. Cherish the time you have with them & know that all your mamas at home are missing and loving you and are so proud of all of you!! I look forward to seeing pictures of the Wonderful sunsets. I’m glad we were on the same fight home for Easter break this year and that you shared with me your excitement for this trip. It was awesome to hear your expectations and anticipations about going to Zambia. It sounds like you’re experiencing everything and more. Grace, enjoyed reading about your Mamas! Please give them a big hug and thank you from us back home. God bless the “Mamas” and the journey. Hi Grace and all the Zags and Mamas. I really loved hearing about the Mamas and the special love they show you all. I’m sure they get the biggest kick out of all the students and your quirky ways and energy. Thanks to all the bloggers so far, it’s amazing to see your beautiful descriptive writing and hear about how Zambia is transforming your minds and souls. Your words bring me to tears just imagining what you may be experiencing and the connections your are making with beautiful people of Zambezi. Hi from home Olivia. It’s Oregon strawberry season and I’ll bring some fresh ones to the airport for your return trip. I’m keeping a list of all the things going on to remember to tell you. Hope you are sleeping well and working hard. Love you so much my girl. Thank you for highlighting the powerful woman who make Zambezi home. I hope all you Zags sitting around the table remember that there are many years of alumni praying for you and following your journey. I have walked your path and I am so thankful you all get to experience Zambezi. It is where a new chapter of my life began. My name is Zac and I went to Zambezi summer 2016. It was because of Mama Violet and Mama Katendi that I was able to participate in the program (I’m allergic to ground nuts). I am forever grateful for their love and commitment to translate and advocate for me. They were my lifeline with unwavering compassion. I keep photos of them both up in my home two years later. Their stories, their laughter, and their songs still give me chills from the videos and recordings I have of my time there. I can’t go without thanking Dodd as well. He fought for me to have the full experience, even when I was unsure myself. He will be there for you all as well, every step of the way to accompany your joy and your struggle. He is a wise man and I’m thankful to have shared my experience with him. Finally, Mamas, thank you so much for creating a safe place for my fellow Zags to grow and learn from Zambezi. Kisu Mwane and Go Zags!